What did you think of DAREDEVIL #604? DAREDEVIL #604 by Soule, Henderson and Milla ships June 20th and here's a preview! I thought this was a stronger issue than the last few. The highlight for me was all the background information of Ordo Draconum. Have they ever appeared in the Marvel Universe before Charles Soule's Daredevil run? For the most part Mike Henderson continues to do fine work with his pencils, but some of Daredevil's encounter with the Beast were confusing. I couldn't tell if the Beast vanished from his throne or simply moved quickly out of the throne. Then, when we see the Beast again in a brand new panel, we can't get any idea where he is in relation to anyone else. I think this could have been done better by trying out some different perspectives, and it would have given the scene a lot more impact. On the very next page, the Beast travels down to the city street, where it looks like there are already Hand ninja gathered. But it was hard for me to tell what the Beast is doing. Is he dissolving into more fog, which is turning into more ninja? That's what Foggy seems to report later. I think this could have been shown with more clarity. Even if it does mean more Hand ninja, I don't think that's enough to cause long-time Daredevil readers worry. After all, just a couple issues ago, Daredevil took down a boatload of them in three panels. Now he has twenty friends with him. I liked the cliffhanger, even though everyone had to know that was going to happen eventually. This issue was a fine addition to the current story, but I feel like Henderson could have done a better job in some key areas. I gave this a three. I enjoyed the last two, and while I enjoyed learning more about father Jordan and think his concept is interesting, I'm underwhelmed. I think I'm over Soule. His run is just mediocre. It seems as soon as the book was getting interesting with Matt's new status quo Fisk returns. And the upcoming Mike Murdock stuff sounds cringe worthy. 2/5 for me. I thought the idea of performing an exorcism to combat the Beast is an interesting one. The Best has always had a mystical component, but I've never thought of it in terms of traditional spiritualism and religion. I don't even have a problem with Matt entering the spiritual realm - his encounters with Mephisto and Blackheart are examples of that. It actually opens up some story potential with the Hand, even if it also potentially bogs it down (sometimes fighting cool Ninjas is way better than fighting the Beast). Plus, I think Father Jordan and the Order of the Dragon are just a lot of fun. There's something that's a bit of Da Vinci Code, a bit of Assassins Creed. I hope that other writers will use them in the future. Maybe a Blade book, who knows (although I think Soule missed an opportunity to reference Tomb of Dracula). The fight itself was fine, but it didn't look like it really got going before the issue ended. But the ending was a nice surprise. Overall, I really enjoyed the issue. First, I absolutely love the cover art, really cool. Agree with Mike, Father Jordan and the Order of the Dragon are a really cool and neat addition to the Marvel Universe. I was always surprised that something like this wasn't present before in the Marvel Universe either with Daredevil or Nightcrawler (or if it was I'm not aware of it). Seeing Matt wield a sword was also pretty sweat. Liked the twist at the end with the Kingpin coming back. If I had one complaint I would like to know what Elektra and the other street level heroes are up to. Looking forward to see how this all ends. 5 stars from me because I thought this issue was awesome. Great focus on Matt, great worldbuilding, great action, and great cliffhanger. That panel where Matt says he’s the sword as he leaps down to fight the ninjas…just wonderful work by both Soule and Henderson. Yeah, it is a really interesting way to think about it, isn’t it? I was surprised by that, yet it’s a really good way to integrate Matt’s Catholicism with the supernatural aspect of the Hand in a way that unifies Matt’s world. I also don’t have any problem with Matt in the spiritual realm either, especially as you point out, it’s already part of his stories anyway. As for how involved fighting ninjas needs to be, well, the Hand seems to have numerous offshoots since there’s always rogue elements turning up so not every Hand story has to have the Beast in it. Plus, I think Father Jordan and the Order of the Dragon are just a lot of fun. There's something that's a bit of Da Vinci Code, a bit of Assassins Creed. I hope that other writers will use them in the future. Me too. 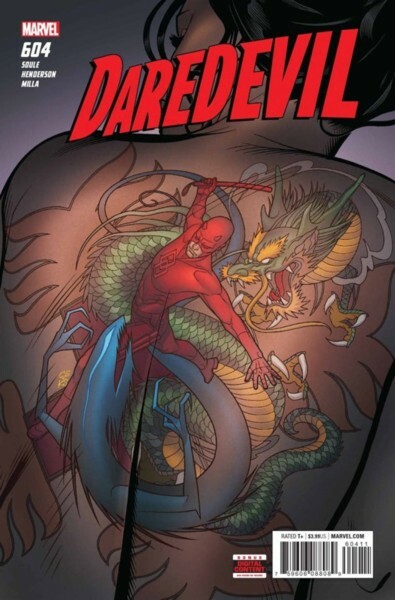 I agree with everyone here that the Order of the Dragon is a fantastic addition to Daredevil’s mythology. It’s a natural addition to what’s already there, which is the best kind of worldbuilding. For the most part Mike Henderson continues to do fine work with his pencils, but some of Daredevil's encounter with the Beast were confusing. I couldn't tell if the Beast vanished from his throne or simply moved quickly out of the throne. On the very next page, the Beast travels down to the city street, where it looks like there are already Hand ninja gathered. But it was hard for me to tell what the Beast is doing. Is he dissolving into more fog, which is turning into more ninja? I thought he was teleporting around, and then he dissolved into ninjas, but I agree it could have been more clearly shown. Maybe we’ll see them next issue? I’m personally wondering if we’ll get any follow up on what the Hand was digging for in the hole we saw two issues ago. It seems as soon as the book was getting interesting with Matt's new status quo Fisk returns. We’ll see what happens. Fisk’s return was inevitable, but him avoiding ninjas and fog while walking around on the streets of NYC in a hospital gown with an IV is a hilarious mental image.